How Does Hearing Loss Affect an Aging Adult’s Independence? 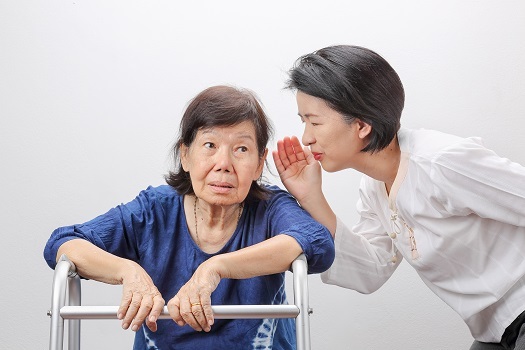 Hearing loss is one of the most common conditions among seniors, and it could affect an older adult’s ability to communicate, learn new information, and socialize. Here are some of the ways hearing loss impacts a senior’s independence. Seniors living with hearing loss often rely on others for assistance with daily activities such as cooking and cleaning. However, the condition makes it challenging to communicate with family members, friends, and caregivers. By investing in technology, family caregivers can enhance communication with their aging loved ones. Vibrating alarm clocks, amplified telephones, strobe lights, and personal hearing devices are a few options to consider. Living independently is important for seniors who want to maintain a high quality of life. For some, this simply means receiving help with tasks that have become more challenging to manage over time. Even when families have the best intentions, they may not have the time to provide the care their elderly loved ones need and deserve. If your loved one needs help for a few hours a day or a few days a week, reach out to Home Care Assistance, a trusted provider of respite care Waterloo seniors can depend on. Hearing loss can impact memory and prevent seniors from staying physically and mentally active. The condition could cause more stress, decrease socialization, and lead to more quiet time, three things that increase the risk of memory loss in aging adults. A decrease in mental acuity increases the odds of developing dementia or Alzheimer’s disease. Family caregivers need to find ways to simplify their loved ones’ daily activities. Recalling simple instructions for daily tasks can help older adults boost their mental health. Older adults with hearing loss may have difficulty following their doctor’s instructions, which puts their physical and mental health at risk. If your loved one doesn’t know how to manage medications effectively, his or her health conditions could worsen. Hearing loss also makes it difficult to hear smoke detectors or alarm systems. Consider installing flashing lights and devices that can alert your loved one when there’s a potential fire or if an intruder is entering the home. Hiring a professional caregiver is a good way to ensure your parent’s safety at home. Waterloo home care professionals can be a wonderful boon to seniors. Whether they require around-the-clock supervision or just need assistance with exercise and household tasks a few days a week, seniors can enjoy a higher quality of life with the help of trusted in-home caregivers. Confidence is important for seniors because it allows them to explore the world and try new things. Maintaining their self-confidence can help aging adults feel valued, respected, and needed. Seniors may feel embarrassed using hearing devices, causing them to reject the gadgets. As a result, they may feel as if they don’t fit in and shy away from social activities. Encouraging your loved one to see hearing aid devices in a positive light could boost his or her self-identity and lower the risk of isolation. When seniors with hearing loss understand their unique and positive attributes, they may feel valued and appreciated and enjoy better self-esteem. Hearing loss is just one of the many age-related conditions older adults are prone to. Seniors can face a variety of challenges as they age, many of which can be mitigated with the help of professional in-home caregivers who provide high-quality elderly care. Waterloo families trust in Home Care Assistance to help their elderly loved ones age in place safely and comfortably. To learn about our premier in-home care plans and how they can benefit your parent, talk to one of our professional Care Managers at (647) 992 0224 today. How Can Using Hearing Aids Reduce Cognitive Decline?